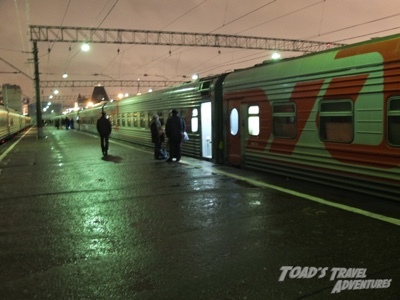 The “Vostok” leaves Moscow’s Yaraslovsky station every Saturday night at close to midnight. Yaraslovsky is not a particularly sophisticated place, and once through security there are really just a few seats, a ticket office and departure board inside. Outside, a few drunks and mad men are on the streets looking for people to accost and share their stories with. I give them a wide berth. I had stocked up on supplies earlier in the day at my local Sokolniki supermarket, and now had an extra three bags to carry containing assorted noodles, biscuits, and porridge, not to mention a stash of reasonable quality European wine. Such was the scale of my luggage that the lady guarding the “special needs” seating area inside the station took pity on me and let me me park myself somewhere easy. The other people here are all families, the old and the infirm. So much for my adventurer credibility! As I arrived on Platform 1 I was greeted by that very distinctive smell of lots of coal being burned to heat up the carriage samovars. An industrial smell, necessary as the carriages have no connection yet to the electricity from a powered locomotive. Train No 020 was a middle-aged but very well presented set of Russian carriages (NB if you are reading this and have also seen the photographs on the excellent Seat 61 website, these are not the carriages used on this service any more, look instead at those on the 001/002 train). I said goodbye to Rita, my ever so kind “helper” and immediately went for a quick walk up front. I was a bit confused what was going on for a moment as the train started to move off without me (don’t panic!) 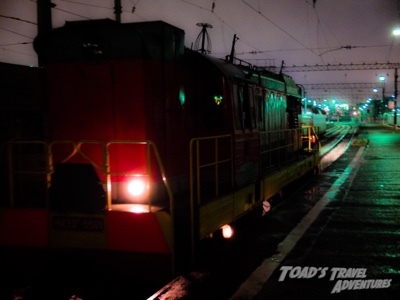 but it was actually just a shunter positioning the carriages on the platform before the main locomotive arrived and was attached for the night’s journey ahead. I was in for a few surprises onboard. The biggest of these were Sergei and Rimma, the carriage provodnitsas (I think that’s the feminine version of the word). Sergei was a well presented man in his 30’s wearing a carefully pressed RZD uniform and fashionable business type glasses. I was pretty surprised when he came to see me to collect my ticket and spoke to me in near perfect English. This has never happened to me on a Russian train before. Deeply impressive. Rima, his co-worker, is so different from the provodnitsas on my last train – she is a blonde lady in her late 30’s who is perpetually happy, and enjoys her work. She only speaks Russian, but is an expert in sign langauage. Just when I could not have imagined anything could be better, a lady from the restaurant carriage popped her head into my compartment introduced herself and a basket of goodies on permanent offer. She was also happy to go and find me an icy Baltika No 7. When she returned I noticed she had hidden my beer under her menu, and it reminded me that I think technically you are not allowed alcohol outside the restaurant carriage on a Russian train, but I think this is very flexible if you behave. 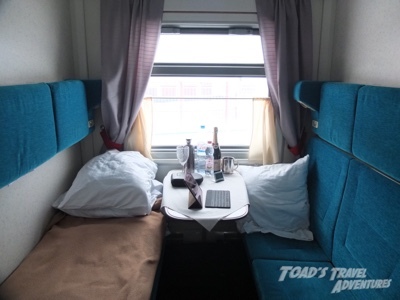 Looking round my compartment, it is the modern RZD type, similar to that of the train to Vladivostok (002). Not quite as good though, in that there is no power supply inside the cabin, but my trusty Power Gorilla should mean this is no big deal. There is a TV and keycard locking system, but but for some reason they do not work. But most importantly to me, there is a locked window, and it takes me 30 seconds to open it up using my special key, and I am rewarded with a blast of fresh wintery air. I can’t work out the system, but seemingly randomly, some carriages have occasional windows with skylights that open up, mixed with others that have totally sealed windows. Once again I have struck lucky. Sleep didn’t come easily to me on my first night, but after we left Vladmir at 02.52 I turned in and got some reasonable rest. I find the good thing about a train journey of this length is that a shorter night’s sleep and a short afternoon nap can be quite restorative. I dont know why this is, maybe just the decadence of knowing that you can sleep when you want to and set your own agenda each day – or even operate your very time zone. No one is going to tell you that you are late for breakfast, or tell you when to go to bed! The plural of provodnitsa is provodnitsi (in the nominative case).